New York (HAN) January 6.2017 Public Diplomacy & Regional Security News. by Amala Karri. Almost a year ago, the Ethiopian government announced the Addis Ababa Master Plan, which proposed an expansion of Ethiopia’s capital into surrounding farms within the Oromia region. The Oromo, who make up 40% of Ethiopia’s population, frequently complain about their lack of representation in the capital, and, following the announcement of the master plan, Oromo demonstrators gathered to show their disapproval and anger. The protests quickly turned violent. On December 16, 2015, Prime Minister Hailemariam Desalegn declared that he would show no mercy towards the protesters. In July, the protests worsened, expanding into Ethiopia’s Amhara region. 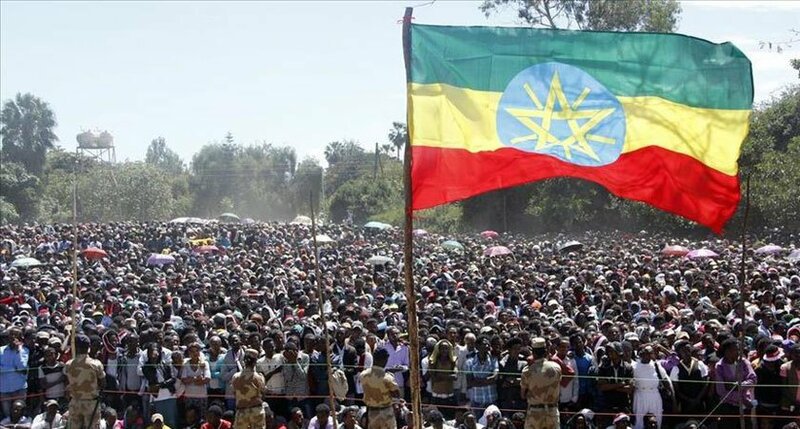 After the Oromo, the Amhara are the second largest ethnic group in Ethiopia, and over the past few months, tens of thousands have come together to demonstrate against government oppression and ethnic violence. The government’s response has been brutal. Since the protests began, approximately 800 people have been killed. The police have responded to peaceful protests with violence, exacerbating the existing tensions: Al Jazeera reports that in one instance, the police fired tear gas and warning shots at a group of protesters attending a religious festival. When the protesters turned to run away, several people were crushed to death, leading to a total death toll of approximately 100 according to human rights groups, and 55 according to the government. Furthermore, the government has conducted mass arrests as part of a larger campaign to silence civilians. According to Al Jazeera, more than 11,000 people have been arrested since the demonstrations began last year. Of these, more than 300 are women. The government has also restrained free speech by shutting down all mobile Internet to prevent communications and isolate those dissidents outside of prison. On December 2, the government partially restored Internet, but social media and messaging platforms are still blocked throughout the country. Unfortunately, the government refuses to acknowledge the valid concerns of Oromo and Amhara dissidents and the legitimacy of their protests. Rather, they have denounced dissidents for disturbing the peace. In a recent statement, a government spokesman vowed to hold those that “started” the chaos responsible. In another statement, a spokesman declared Egypt and Eritrea responsible for the violence, alluding to the possibility that the government would ban protests to try to end the unrest. These protests have the ability to lead to political change. For the first time, the Oromo and Amhara oppositions have coalesced into a single force against the government, and now pose a greater threat to Ethiopia’s political leadership. The authoritarian regime’s increasing fear of subversion could make it more responsive to its citizens’ needs. The Oromo need a stable government just as much as the government needs the Oromia region—the source of much of Ethiopia’s food and most of its coffee (a large export). Political change in Ethiopia is critical. The Oromo are a historically oppressed group that have not been offered the same economic and political opportunities as the Tigrayans. It is unlikely that the protests will end until the government acknowledges their legitimacy and agrees to implement reforms. For now, it is unlikely that the opposition will trust the current ruling coalition, the EPRDF, to make necessary changes. For years, it has simultaneously promised to implement reforms and violated human rights. Until they are truly held accountable to their people or a new coalition comes to power, hundreds more Ethiopian dissidents will likely be mercilessly killed and tortured, and thousands imprisoned. In addition the the need for internal reforms, other countries must fundamentally change the way that they deal with Ethiopia. Human Rights Watch has called for influential countries, such as the US (Ethiopia’s largest donor) and the UK, to publicly condemn the Ethiopian government’s actions. These allies should also push for an international investigation of Ethiopia’s deteriorating human rights situation, both increasing increasing the transparency of how the Ethiopian government deals with dissidents and political opponents and sending a powerful message that such actions will not be tolerated. Now is not the time for the US to stay silent. Amala Karri is STAND’s policy intern and attends Hunter College High School in New York.